There’s been a lot of talk about space in the news lately. Monday marked the fortieth anniversary of NASA’s Apollo 11 lunar landing. On Sunday, an amateur Australian astronomer discovered a fresh hole in Jupiter’s atmosphere the size of the Pacific Ocean. And this afternoon, residents from the Ganges River in India to remote islands of the Pacific witnessed the longest total solar eclipse of the century: six minutes. My family lived outside of Washington, D.C., in the ’70s. We visited the capitol frequently enough, but what I remember is The National Air & Space Museum: Kitty Hawk, Spirit of St. Louis, Bell X1. One of my earliest and favorite Christmas gifts was a telescope. Sure, I used it to spy on the neighbors — until I discovered that it horizontally flipped my vision. So I looked at the moon. I learned to spot Venus and Mars. I spent hours searching the inky black night sky for specks of light. When I was ten, and my parents were separating, my mom moved back to Washington, D.C. Her office was next door to NASA headquarters. I begged her for weeks to get me photos of the brand-new Space Shuttle. Eventually, a manilla envelope arrived on our Chicago doorstep, return address: 300 E Street S.W. Washington, D.C. 20001. The Space Shuttle will stop flying in 2010. 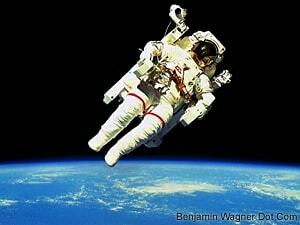 Until 2015, the Russians will transport American astronauts into space. Meanwhile, 3800 NASA employees will rally around the now fifty-year-old government agencies Constellation Project. It’s goal? To return man to the moon by 2020 powered 11.8 million pounds of Ares V thrust. Sure, NASA was a product of the Cold War, a component of the military industrial complex fueled by over 4% of the federal budget. But the pursuit of the moon and beyond was something else, something greater, more abstract, almost religious. Space is the ultimate Great Beyond. Less than 5% of it is even perceived by humanity. The rest is just dark matter. What could be more courageous — whether in 1962 or 2009 — then, than gathering all of our faculties, all of our better selves, working together, and charging head-first into the unknown? What could be more meaningful than looking for answers from the Great Beyond?